Is a single-species cover crop or a “cocktail” mixture the best choice? Photos: A. McGuire. 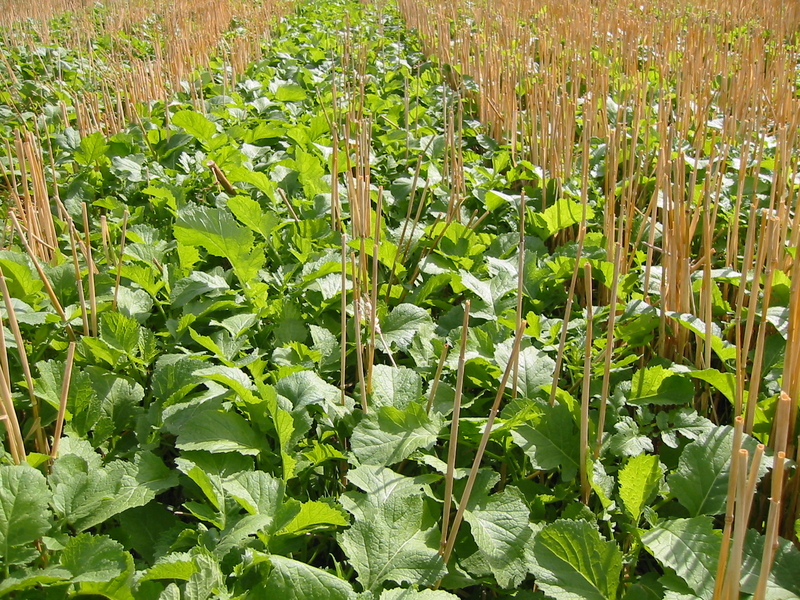 Weed suppression by a cover crop is often desired, even if (because herbicides are used in the main crop, for example) it is not the primary goal. Smith et al. (2014) found no evidence that mixtures (five species, in their case) enhanced weed suppression over monocultures. They noted that weed suppression is related to the competitiveness of a crop, where biomass production is a major factor. If you have a mixture that includes a less aggressive, less productive species, like many legumes, this will decrease weed control. Similarly, a team from Penn State found that there were no significant differences in spring weed suppression between the most productive monocultures and the mixtures. As their webinar states: “You do not need a mixture to get good weed suppression.” The legume monocultures did not suppress weeds well, but mixtures with legumes were similar to the best monocultures, probably because the aggressive species in the mixes, here oat and rye, dominated the legumes in the mixes. Think about this: if the dominant species is suppressing weeds, would it not also be suppressing your less dominant planted species? After all, to a rye plant, a clover plant is as much a weed as lambsquarters. Thus, getting weed suppression is limiting your opportunity to supply nitrogen from the legume – there is a tradeoff; mixtures are not win-win. We will return to this. A Miyazawa et al. (2014) study looked at nutrient recycling by cover crops (often referred to as the “improved soil fertility” ecosystem service, although no nutrients are actually added to the system). This would be important for reducing the leakiness of some agricultural systems, especially where nitrates are leached in the winter. They found no differences, over four years, in the nitrogen, potassium or phosphorus uptake between monocultures and mixtures. Similarly, the Penn State study found that monoculture rye reduced nitrate leaching as well or better than mixtures. Do you see a trend here? Canola flowers attract beneficial insects. Photo: C. Rebler. Although the Penn State team was the only one of these recent cover crop studies that looked at pest control benefits of mixtures – they counted the beneficial insects – what they found fits the pattern; the presence and density of flowers in the crop (mono- or polyculture) was more important than species diversity. 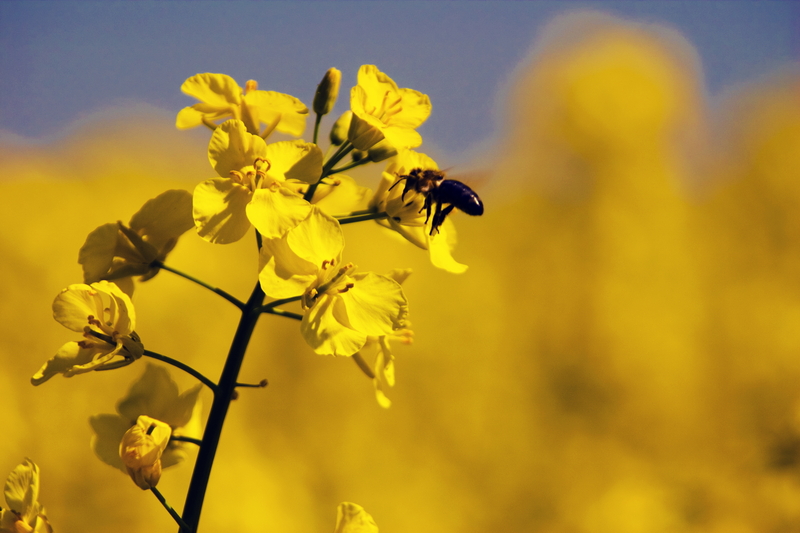 In their study, the monoculture canola crop had the most flowers per acre, and so attracted the most beneficial insects. The exception to this recurrent theme of monoculture out-performing polyculture, is when you grow legumes in low nitrogen soils (for legume crops in rotation, see Smith et al. 2008). In this situation, it is the powerful nitrogen effect (an “interspecific synergy” according to Hayden et al. 2014), as has been seen in so many studies over so many years. In Hayden et al., as opposed to Wortman, monoculture yields of legumes were equal or greater than those of rye. Make no mistake, this is a nitrogen effect, even when it is labeled as synergy or other such terms. The effect of nitrogen on plants, whether it comes from legumes or from nitrogen fertilizer is well known and reported in many studies each year, so it should not surprise anyone to find that when mixtures including legumes are compared to monocultures without legumes on low-nitrogen soils, that the mixtures produce more biomass, and so suppress more weeds, and provide more soil cover. In soils with higher levels of nitrogen, however, the effect disappears and monocultures beat the best mixtures, even those including legumes. Hayden et al. did not find any synergistic effect of mixtures on N fixation by the legumes, or on weed suppression. What they found were tradeoffs; the more rye in a mix, the better the weed suppression; the more legume, the higher the amount of nitrogen fixed, but the worse the weed suppression. 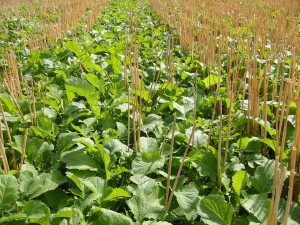 Monoculture cover crops (like mustard shown here in wheat straw) are most productive and provide the highest level of individual ecosystem services. Photo: A. McGuire. This is the general conclusion of current research, that there are tradeoffs in obtaining ecosystem services from cover crop mixtures. One crop grows quickly, produces a lot of biomass and suppresses weeds well. A legume grows more slowly but fixes nitrogen. When you mix them, the productivity of the first crop is reduced as is the nitrogen fixation of the legume – there is a tradeoff. This is contrary to the win-win hypothesized in ecology, where complimentary effects between species overcome competition between them. Other than the nitrogen effect from legumes, however, evidence for this is rare. Damour et al. (2014) evaluated 28 species for cover crop use in banana production. They found that most species were good at providing some services, but not at others. No one species provided all the services they desired, and while mixtures provided more services, the level of those services was reduced (diluted). Tradeoffs, rather than complementarity, seem to be the rule, at least with annual, short-season crops, with one species diluting the effects of the other and vice-versa. And the more species in the mix, the more diluted each species’ unique services become. The services are, in a twist of ecological terminology “density dependent”; the fewer plants of a species in a field, the less of that species’ services per acre. These results challenge popular thought on the topic, including statements made by some in NRCS (here and here, although more often they are spoken and not in print), to the point that some researchers have conducted studies specifically to test these proclamations. One such claim was that cover crop mixtures use less water than monocultures, a critical factor in use of cover crops in regions like the Great Plains. Nielsen et al. (2015) grew 10 monoculture cover crops and compared their use of water to a 10 species mixture. Contrary to the claims, over two years the research found no significant differences overall in soil water contents or growing season crop water use between the monocultures and mixture. The cover crops all used more water than would have just evaporated (fallow) showing there is a cost for farmers growing any cover crop in that region. The researchers surmised that when mixtures do not use as much water as monocultures it is not some synergy in the mixture, but rather a reflection of the lower yields in the mixture compared to the best monoculture species, and since water use is related to yield, less water is used in the mixture. Again, there is a tradeoff here between yield and water use, not synergy between species. The figure above (from Tilman et al., 2014), is similar to one I shared in Part I of this post. It displays results of modeled ecological theory: an increase in the number of species will result in higher total community biomass. 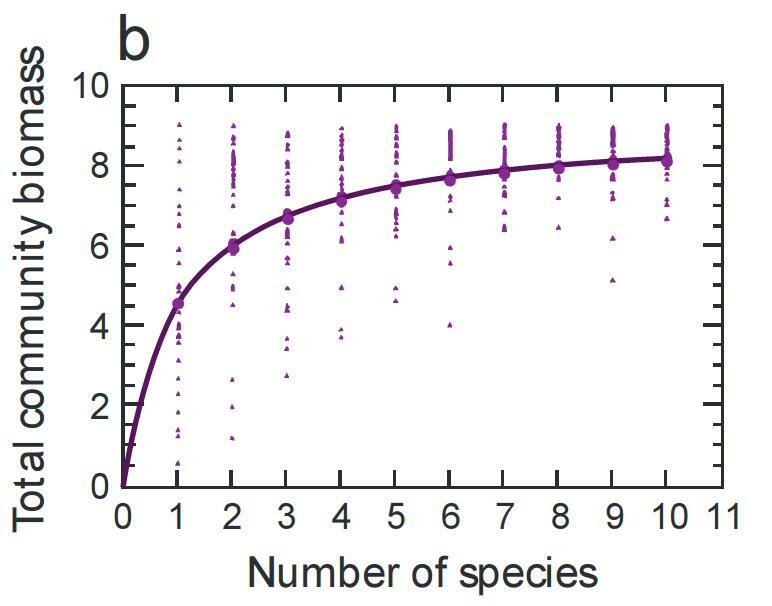 While it may hold true in natural systems, it is not supported by recent cover crop studies, where increasing the number of species did not enhance their performance (in Wortman, going from 2 to 8 species, in Miyazawa, going from two to three species, did not increase biomass or stability). Perhaps if we were growing perennial species over several years, then a mixture would be an advantage, to counter soilborne diseases (Schnitzer et al. 2011) if nothing else. However, in annual cropping agriculture, and especially for short season cover crops, there appears to be no advantage to mixtures with the exception of combining grasses and legumes on low-nitrogen soils. “Diversity may be there for a reason…but that does not mean that diversity is there for a purpose.” This is a favorite quote from R. Ford Denison’s book, Darwinian Agriculture. In short, it means that we should not assume that everything in nature is optimal for agriculture, and so we should not mimic nature haphazardly. For crops, and for cover crops, we should use the best monocultures, rotated in time to provide diversity. Don’t dilute the strength of a species by putting it in a mixture with lesser (for a specific goal) species. I believe this leaves you with the choice: 1) choose one primary goal for your cover crop and then plant a monoculture of the species that will best achieve that goal, or 2) choose a few goals and plant mixtures of species that best achieve those goals, recognizing that each of them will provide less of their service in a mixture than they would as a monoculture. However, if one of your goals is weed control, the second option is not a very good one. Achieving some degree of other goals at the expense of weed control means that some weeds will not be controlled; they will go to seed and potentially increase future problems. Finally, instead of continuing to try to show that polycultures are better than monocultures, let’s improve the rotations of monocultures, including cover crops, and reap their known benefits. And let’s recognize that although ecological theory may work in nature, agriculture is not nature, and works differently. Figuring out how agriculture works best is a big enough job for both agronomists and agroecologists. Penn State cover crop project: webinar, slides, publication, website. Tilman, D., Isbell, F., & Cowles, J. M. (2014). Biodiversity and Ecosystem Functioning. Annual Review of Ecology, Evolution, and Systematics, 45(1), 471. 3 thoughts on "Monoculture vs. Polyculture Part II: “Straight up” beats “cocktails” for cover crop ecosystem services"
Another informative posting – very well written also. Think you have a clear preference for monoculture cover crops against polycover crops which blur your judgment. Why would the possibility for soil borne diseases on a monoculture cover crop in the future be higher as against poly cover crops and still be considered better? Doesnt make sense. Finding the right ratio have been proven to increase soil organic matter much more as against monoculture cover crops which drives soil fertility. Some of what you said may definitely be true but as a whole I think you have it wrong. Gert, I try to let the research results speak for themselves; and I think they show that in many cases, monoculture cover crops perform the best. If you have research that shows otherwise, I would be glad to reevaluate my position. Regarding the soilborne disease, as I tried to convey in my post, the problems in the monoculture came several years into a study using perennials, so I would not expect the same problem in short-term cover crops which are primarily annuals grown for only a few months at most.